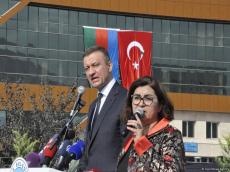 Every effort should be made to ensure that the Khojaly tragedy is recognized at all global platforms as the genocide of the Azerbaijani people, Russian MP, head of Russia-Azerbaijan Inter-Parliamentary Friendship Group Dmitry Savelyev said. He was speaking at the opening ceremony of the Khojaly park and the monument to the victims of the Khojaly tragedy in the Turkish city of Kayseri. He addressed foreign students who study at Kayseri universities and who attended the ceremony.